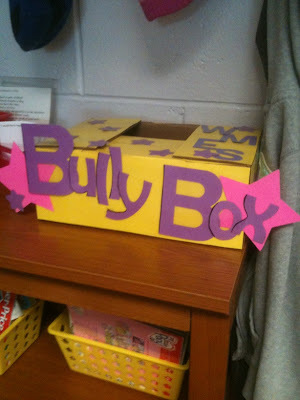 In the main office of Waller Mill Fine Arts Magnet, an elementary school in Williamsburg, VA, where I spoke on 1/19/12, I saw a simple yet inspired way to combat bullying—a box for students to anonymously report hurtful behavior. While I’m all for being creative in approaching this serious issue, at first I was skeptical (but not critical) of this particular method. The box is in plain sight of the office staff. I asked if kids were hesitant to use it because it’s not really anonymous when others can see them dropping in a note. One of the staff told me the kids do use it—often in groups. Then I realized it may well be especially effective situated in such a prominent location. Every time a bullied student leaves the office, s/he’s reminded that the school is looking out for her/him. And every time a bully leaves the office, s/he’s reminded that the school is out for her/him. I like the idea for younger grades. Perhaps too much of a chance it would get abused in the older grades? Bring back the Sea World superheroes poster!